Global Quality Edge Fund letter to shareholders for the second quarter ended June 30, 2018. Global Quality Edge Fund’s total return during the second quarter was +1.39% and +5.35%, when measured from the start of 2018. It has now been a year since we embarked on this venture on our own and while it may not be much in terms of time, we look back and feel very satisfied of our achievements so far: the companies we’ve discovered, the return of the fund and, above all, the trust placed in us by our investors that have allowed us to grow and reach almost EUR 5 million of assets under management. By the end of the year, our aim is to reach EUR 10 million, easing our entry to capture and grow further with institutional investors. In the last 4 quarterly shareholder letters, we focused on explaining Global Quality Edge Fund’s investment strategy and how we go about analysing the companies in our fund from a qualitative perspective; from understanding their business model, their competitive advantage against peers, to assessing the capital management implemented by senior executives. Today, we would like to shift your attention to the likelihood of coming across ‘red flags’ in a company’s finances and how these plays into our stock selection. To start, we define a ‘red flag’ as an accounting risk that may jeopardise a company’s future earnings as well as their expected cash position. There are many types of ‘red flags‘ but the key will be in finding those that are most meaningful. To avoid falling victim to them, it is always best to thoroughly read through annual filings; even though these will not always be easy to grasp and at times will require a certain background in accounting to fully understand them. Mastering them is not always easy. As time goes by, company reports continue to grow in length, new accounting practices are released almost every year which make their interpretation a constant challenge for the reader. Red flags' will become more frequent in nature at a time like now, when the economic cycle of the U.S., for example, is coming to an end and companies may struggle to continue growing their earnings at the same rate as they did before. Under this scenario, senior management could find itself 'motivated' or 'incentivised' to apply more aggressive accounting rules to maintain earnings per share and cash flow. It is then our job to see if we're facing a potential risk and understand if the underlying figures are cast into doubt by the 'red flag'. To do so, we have classified more than 100 different types of 'red flags', a list which comes in handy to identify potential accounting risks and understand a company's management thought process. Our recurring outreach to senior executives is of enormous benefit to later clarify or confirm our initial findings. Let's now look into a few 'red flag' case study’s example. 1) Aggressive accounting policies in M&A deals. After a merger takes place, the acquiring company and its senior management will feel mounting pressure to release the pro-forma financial statements, meet expectations of investors and consolidated earnings promised before the deal was struck. Given this added responsibility, the company, on the day of completion, must value all the acquired assets and liabilities, which could lead them to adopt accounting policies and forecasts that put the transaction under a favourable light and justify the price at which the deal was closed. Mitie Group plc is a facilities management company, providing outsourced managed services on a wide range of fields including project management, consulting, office management and other specialties, in the UK and abroad. In 2012, Mitie Group acquired Enara, a leading British company in homecare services. Mitie's CEO at that time, Ruby McGregor, widely proclaimed the benefits of the transaction. On that same earnings call, pricing pressure in the pharmaceutical business was acknowledged. In both extracts, you can see how the overall tone when speaking about the transaction was positive, even after Enara was integrated into Mitie. However, if we refer ourselves to the annual 2013 filings - one year after the transaction was completed - the goodwill footnote (table 1) amounted to GBP 447.2 million (45% of the total consolidated balance). In parallel, Goodwill also represented almost 45% of the company's total market capitalization, an alarmingly high percentage that lead us to be more inquisitive and dig even deeper. To start off, Enara represented 20% of total Goodwill, according to the footnote relating to this line item. Second, we analyse the total value of the net acquired assets, as well as the price of the deal, based on footnote number 31 from the previously mentioned annual report (table 2). In Table 2, we can see how more than 80% of the total deal value was assigned to Goodwill, leading us to believe that Mitie was adopting a very bullish forecast on Enara's future business. Aside from this, almost 25% of the deal value was made up of intangible assets, relating to client lists - a seemingly high estimate by Mitie's senior management. The years that followed proved to be challenging ones for the pharmaceutical line of business and yet the company didn't find the need to write off any of the Goodwill, despite not being publicly hesitant to carry it out if the business unit did not show any signs of improvement. In 2016, Mitie's management released their annual report and continued to avoid applying a Goodwill impairment; however, they did report discontinued operations for a total of GBP 38.2 million, as the total value was below the recoverable amount. 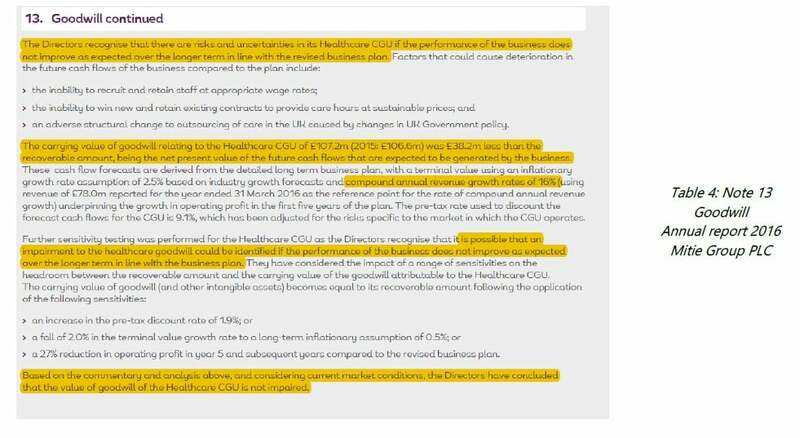 If we analyse note 4 in detail, we can see how Mitie's over-optimistic view on the business is put into doubt, with combined growth rates of 20% for a line of business that we already knew had operating losses even before the transaction was closed. 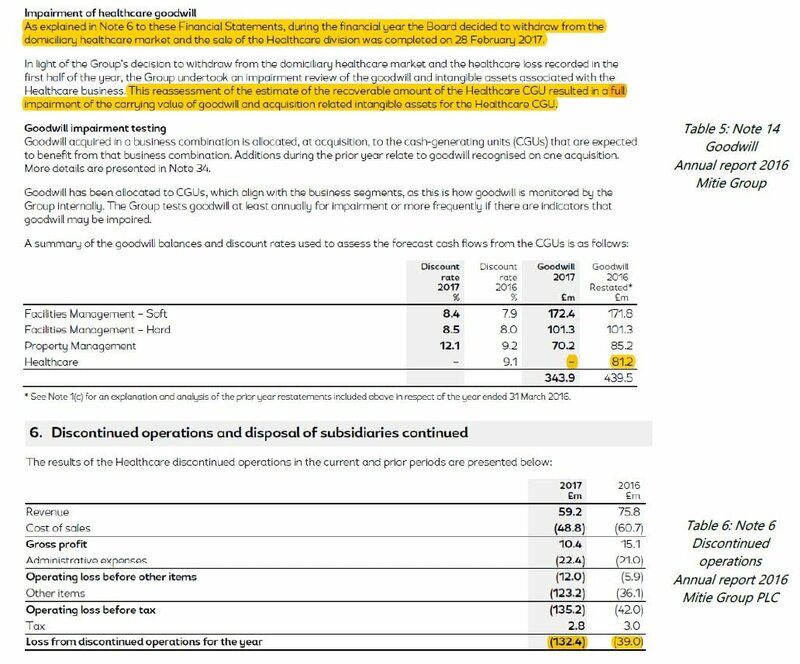 In the end, these problems came to surface and in 2017, Mitie announced their exit from the pharmaceutical business (Table 5) and made effective the Goodwill Impairment for the full amount of the pharmaceutical unit (Table 6), leading to losses due to discontinued operations worth GBP 132.4 million. On 19th September 2016, after the earnings calls with analysts announced company guidance, the share price saw a 28.8% drop and even today there are still 40% below the levels seen at the end of 2016. What is the lesson to be learnt? Companies with a high level of Goodwill vs market capitalization, serve as a good indicator to analyse the deals that have been completed in greater detail. 2) Off-Balance Sheet Liabilities (Operating Leases). Operating leases are Off-Balance sheet items. The effect on operating cash flow is neutral because the Income Statement already incorporates rent/lease expense. In 2019, under new IFRS guidance, all companies will be obliged to capitalise their operating leases on the balance sheet, creating an intangible asset on one side, a liability in the form of loan on the other side of the equation and changing the lease expense into an amortization of said intangible asset - like how you would treat financing leases of capital goods. The total amount to capitalise on the balance sheet will be the future net value of the annual payments. This new measure will have a direct impact on companies' indebtness and profitability, especially those in retail, restaurants, airlines, among others. The new accounting guidance will not be applied equally between US GAAP and IFRS. While IFRS will treat all leases as financing leases, US GAAP will not. Norwegian Air Shuttle ASA (NAS) is the 6th low-cost airline by size in the world ranking with more than 500 routes and 150 destinations. If we analyse their latest 2017 annual report and land on Note 22, we can see the airline's total debt on Balance Sheet. The book value of total debt is NOK 26.306 million, a very high level of debt considering the company reported operating losses in 2017. Nevertheless, this can be explained by the business model they run and the rapid growth they have experienced. 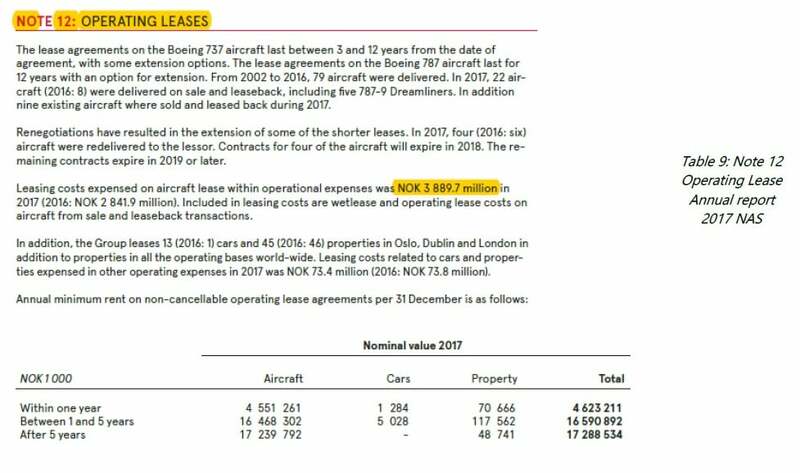 If we take a closer look at the operating expenses, we can see how NAS uses operating leases to finance its aircrafts with an annual expense close to NOK 6.851 million (table 8) which now makes us think about the total debt incurred by the company. At this point, we first need to ensure that NAS is not part of the early adopters of the IAS 16 accounting policy, relative to leases, which can be confirmed by reading Note 1 of the 2017 annual report (text 3) when referencing the accounting criteria used. The last highlighted paragraph of the previous extract assigns an approximated value of the impact operating leases have once capitalised on the balance sheet, as IAS 16 advises to do, with a total ranging from NOK 25 to 28 billion. We would then have to add this amount to the total gross debt of NOK 26.304 million. If we calculate the net present value of the annual payments (adding the 3-line items of Table 9) and we discount at its marginal rate, we obtain a figure similar to NOK 25-28 billion, as stated by the company. If we were to be stricter with our calculation, we should really subtract the wet lease with less than 12 months to run and a few other sale and lease back contracts. In a company's statement of cash flows, accountancy treats employee share-based compensation as a non-cash cost; in other words, the cost is added back to calculate the operating cash flow, similar to what you would do with the cost of amortizations. When running valuation exercises and calculating the operating cash flow of a company, it is important that we adjust this cost whenever we see this as a recurring line item. Case study 3: Paypal Holdings Inc. In Paypal's 2017 annual report (Table 10), we can see how the employee share-based compensation is added to calculate the operating cash flow (CFO) which makes up almost 30% of OCF for 2017. We would therefore need to subtract that compensation scheme line to avoid underestimating our CFO. In parallel, cash flow from financing activities (Table 11), shows how there is a true cost associated to share-base payment, as the company repurchases shares to maintain a stable number of shares outstanding. What is the lesson to be learnt? Always review for recurrent costs that are added-back in statement of operating cash flow (CFO). 4) Pension fund deficit: Calculations and assumptions. This is perhaps one of the most complex line items to understand when reading information about pensions in the company's annual reports. 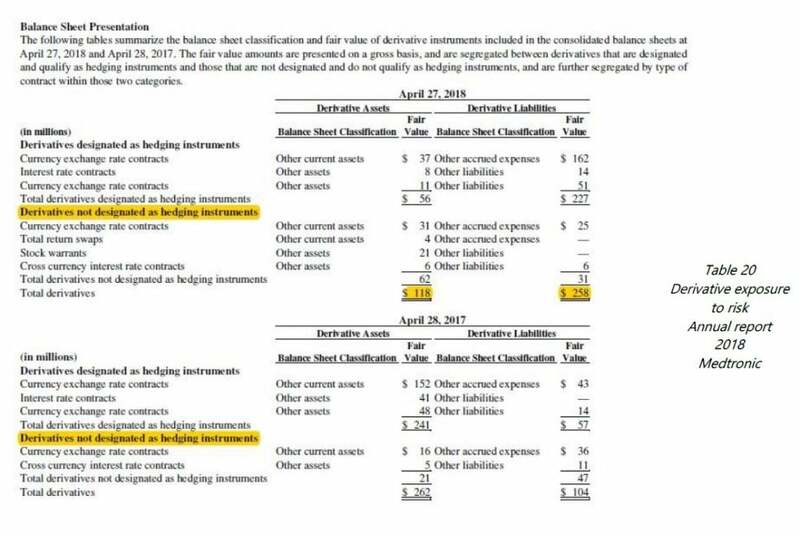 If a company is showing a pension fund deficit, we need to treat that number as an additional liability or debt in our analysis. On top of that, we need to study the assumptions senior managers have used to calculate the expense on pensions in the income statement. By doing so, we ensure they are not to applying an over-optimistic assumption in their calculations. Case study 4: Delta Air Lines Inc. This major US airline ran a pension deficit in the last 5 years close to 30% of their market capitalization, a clear 'red flag’ without any doubt. Let's now take a look at their pension scheme information broken down in their latest annual report, in Note 9. At a first glance, we can see how underfunded the pension scheme is (Table 12); in other words, how the benefit plan assets are less than the projected benefit obligations (PBO). The fund status currently stands at USD - 6.952 billion, despite a 35% reduction in their underfunding vs. 2016. If we now look at their assumptions (Text 5), we can see how the expected return on the fund’s assets in 2017 (8.96%) appears to be unsustainable in the long run. This figure can be called into question especially at a time when: (1) the economic cycle in the U.S. begins to turn and (2) the average return for U.S pension funds in the last 10-15 years is around 7%. When put into context, Delta's assumptions on their own pension scheme return could lead us to believe their senior management is applying aggressive accounting policies. If our conclusions are true, a lower than expected return would translate in a higher pension expense on the Income Statement and have a subsequent negative effect on the company's future earnings. One way to adjust the over-optimistic view of Delta's senior management is to calculate the real impact on earnings, in other words, multiplying the difference between returns times the value of plan assets (1.96% x USD 14.744 billion) leaving us earnings before profit of almost USD 300 or USD 0.4 per share. In table 13 (Note 9 of the filing), we can see the breakdown of the pension scheme's investments by assets and how it shows a strong preference to invest more than 50% of their portfolio in the stock markets (even after a small decrease versus 2016). If market indices began to offer lower or negative returns, the pension deficit would undoubtedly increase. Another assumption that a company needs determine is their discount rate (table 14) in order to calculate the projected benefit obligation (PBO). At each reporting period end date, companies have to value at market prices which is why the discount rate is so important: it will have a major impact when calculating current service costs as well as interest cost. The company's management can choose at their own discretion between one discount rate and another; they can opt for a higher rate to reduce service costs or a lower rate that will increase pension commitments. It goes without saying that there are other variables that affect the present value of the liabilities and assets, including salaries inflation rate, employer contributions, changes in actuarial model assumptions, among many others. What is the lesson to be learnt? A detailed analysis of the company's management's assumptions for their benefit pension plan scheme serves as a good indicator if they are aggressive or conservative in their calculation's assumptions. 5) Cash and restricted cash (cash available for shareholders). A lot of multinationals have a large part of their cash and cash equivalents in foreign affiliates outside of their headquarter country making them unavailable for direct distribution among investors. As a result of this, we must adjust this line item for overseas cash repatriation costs at the given tax rate. Apple has a total cash position of USD 250 billion but we cannot assume this full amount when valuing the company without first accounting for the taxes that must be paid when repatriating back to the U.S. In the 2017 annual report (Table 15), we can see how much of this cash is outside the U.S.
What is the lesson to be learnt? Never assume 100% of total cash and cash equivalents is availability for distribution to shareholders when you are valuing a firm. 6) Contractual obligations detail and future payment liabilities. Companies disclose future payment liabilities relating to debt, suppliers, creditors, capital and operating leases, provisions, contingent provisions and any other long-term contractual obligation. Analysts must; therefore, factor in these items to determine all cash outflows a company will have to pay and the minimum required liquidity it needs in order to meet them. Case study 6: Tesla Inc.
We are all familiar with Tesla's all-electric vehicles and clean energy business, but it is important to remember that it remains a highly leveraged company, despite its short-term success. Since we are now towards the low end of the interest rate cycle, Tesla could end up in financial trouble under an economic interest rate upward cycle, which is why it becomes even more relevant to understand cash positions to serve future payments in high indebted companies. In Table 16, we can clearly see how debt payments make up a vast majority of the company's future outflows of cash, but we could also expect even more substantial payments to come, if there is a significant change in interest rates leaving Tesla without the possibility to service its debt. What is the lesson to be learnt? Investigate always for any liability that can increase the leverage and reduce free cash flow. 7) Assigning recurring acquisition costs as Capex. When valuing companies on Free Cash Flow metric, on occasions, analysts don’t adjust for acquisition capex when these costs are recurring or necessary to sustain the company's sales growth. We do so by subtracting the average acquisition Capex so that our number is comparable to other companies that are not growing inorganically. Under Table 17 and 18, we can see the inorganic Capex for 2017 and 2016 but if we go back by about 10 years, Econocom spends on average EUR 35 million or the equivalent of 1% twelvemonth sales in acquiring other businesses. We can then conclude that it is a recurring amount, which we must subtract when calculating our Free Cash Flow. What is the lesson to be learnt? Without adjusting for recurring Capex, we could expose ourselves to an overvalued Free Cash flow for a company that relies on inorganic and recurring acquisitions to deliver year-on-year growth. Investors must ALWAYS review the auditor's opinion on a company's financial statements making sure it has the word 'unqualified'. 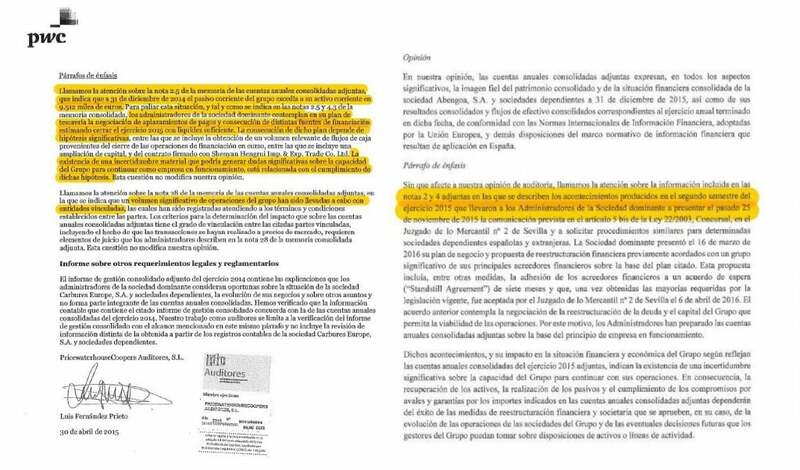 This guarantees the auditor's agreement without exceptions on the presentation and content of its financial figures. Other expressions of opinion would need to be reviewed in greater detail. A 'qualified' opinion - or one with exceptions - would mean the auditor partially agrees with the presentations of the financial statements but may have some reserves on certain points. By contrast, an adverse one, indicates disapproval as the numbers fail to accurately reflect the current socio-economic status of the company. Lastly, 'disclaimer of opinion' signals an absence of judgement from the auditor, due to lack of information or collaboration from the company under audit. In both cases (Text 6 and 7), the auditor expressed their unfavourable view on the financials due to several reasons, which forces the investor to dive deeper in their analysis and rule them out as possible investments. Fraudulently misstating financial statements not only deceives investors but could also imply auditors in the process. What is the lesson to be learnt? On most occasions, reading through the auditor’s opinion will helps us identify possible 'red flags'. 9) The use of derivatives in accounting financial statements. The use of derivatives is another complex component within a company's accounting and auditing but in general terms, they need to be identified as either an asset or liability on the balance sheet; at either a market or reasonable value, if market prices were deemed unreliable. Changes in these instruments from one period to the next must be booked as either income or capital and this is perhaps one of the biggest challenges to break down. General accounting guidelines under IFRS and USGAAP differ on how they should be treated which is why it is important to read up on the footnote in the filing to see if the company has had a significant change in their year on year market exposure as well as any other relevant qualitative and quantitative information. Under USGAAP, derivatives are classed into several types 1) foreign exchange derivative - commonly used to hedge the net asset value of foreign subsidiaries in a foreign currency. 2) Fair Value Hedges are used to offset or compensate the fair value changes of an asset or liability on balance sheet while 3) cash flow hedge is aimed at mitigating variability in a company's cash flow from a specific risk on balance sheet. Only Fair Value Hedges are recognised as a profit or loss on the income statement. The other 2 derivatives fall under a company's Equity and are outlined in detail under the statement of retained earnings. Reading up on derivatives within a company's accounting will shed light on a company's perception of balance sheet risk and the type of hedging instrument it uses to mitigate them. We Looking at this section within the filing, we should ask ourselves 1) Which risks are being hedged by the derivatives 2) Is it material the amount of money in derivatives in terms of the balance sheet? 3) What is their maturity? 4) How do they classify on balance sheet? 5) What is the impact of the profit or loss that is yet to be accounted for under equity? Medtronic develops, manufactures, sales and distributes medical devices to hospitals, doctors and patients around the world. Under text 8, an extract from their filing, we can see how MDT uses foreign exchange forwards to hedge their sales for USD 11.5 billion in April 2018. Their total consolidated sales from abroad is USD 14.078 billion, meaning 82% of them are being hedged. Under Table 19, we see the market value of the derivative instruments, separating those that don't qualify as hedging. At the end of April 2018, the market value of the assets is USD 118 million and USD 258 million, for liabilities. Table 20 shows the impact and the profit or loss from derivate instruments which are broken down to identify which of them are cash flow hedges and which are not. MDT accounts for a loss in equity of USD 404 million at the end of their fiscal period and to the right of the table, we can see how that amount is then reclassified in 2018 under the P&L with a total sum of USD 69 million. What is the lesson to be learnt? The use of derivative by a company could serve as an indication into the type of risk it's assuming, as well as their internal policies to hedge sales or effective cash flow management. The top 10 holdings represent more than 53% of assets under management and the top 20 investments, more than 82%. By geographic distribution, 29% is concentrated in Europe, 22.5% in the United States, 21.3% Global, 12.4% Canada while 14.7% is in Emerging Markets. By competitive advantage, 41.2% are due to size or are serving niche markets, 28.7% owe it to switching costs, 22.2% intangibles while 7.9% are because of a network effect. If we break it down by size, more than 90% are SMid Caps* and, on average, there are 9 broker analysts covering the stocks in our fund. Our 1-year local Beta is 0.56 and the 3-year local Beta is 0.61. The fund's price to earnings is 13.86x, in other words, a discount of more than 30% versus 19x the market's price to earnings. All in all, we have a cheaper fund of higher quality versus that of the market, supported by an average return on invested capital (ROIC) close to 16%. During the second quarter of the year, we made new investments in 2 companies that may not strictly fall into our fund's preference towards smaller cap companies; however, we will not turn a blind eye to larger market cap companies if the market has them on offer and we consider a 'bargain'. Vetoquinol, S.A. (VETO) is a French business with EUR 628 million market cap, specialized in manufacturing veterinary pharmaceuticals for pets and livestock. The family owns 62.5% of shares and the employees, 4.6%; largely unchanged percentages since 2010. Despite it being the 7th largest player by worldwide market share, the veterinary pharmaceuticals industry is surprisingly concentrated among the top 4 players, making up 52% of the world's market share while the next 5 competitors only have 15%. On 31st May, we spoke to VETO's senior management to understand their product positioning and how they competed. After our exchange, we were told how VETO competes in niche markets selling medication for treating mastitis, bacterial respiratory and reproductive diseases in livestock and osteoarthritis, dermatitis and parasitic treatments for pets. VETO's average return on invested capital in the last few years has been approximately 13% with a strong trend, in our opinion, to continue maintaining that rate. Their average purchase share price was EUR 50.5 which can also be read as 15.2x price to earnings multiple. For now, we will continue to wait patiently for a market correction that will allow us to increase our share. Winpak Ltd. (WPK) is a small Canadian manufacturer and distributor of packaging products for the food and pharmaceutical industry, with a network of 10 factories across 10 different countries. It has a predominant presence in the U.S. and Canada. company and has a total market cap of EUR 1.862 million. Its competitive advantage lies in one of its patent-protected flexible packaging products. We like the fact that Its clients are not price sensitive which means WPK is in some ways shielded from economic downturn cycles. in the last 10 years of business, WPK grew at an average compound growth rate of 6% in sales (organic and inorganically) and double-digit growth in profits. In their latest earnings release call, WPK has changed to a more conservative tone, anticipating short-term challenges. This announcement triggered a sell-off in shares, making it an interesting entry-point to invest. The uncertainty is mainly due to the recent commercial trade war initiated by Donald Trump that increase costs on raw materials, like aluminium and steel. In our view, we see it as a temporary issue, as WPK is flexible enough to source its supplies in other areas without exposure to tariffs. Return on Invested Capital (ROIC) for the last 10 years has reached almost 20% and we see this as sustainable in the future. The weighted average price per share was USD 44 with a cash price to earnings ratio of 15x. Lastly, in the second quarter we acquired Inditex and Facebook; both extraordinary companies with a great market capitalisation. Founder and Portfolio Manager of Global Quality Edge Fund. Appendix: Total returns and benchmark indexes.